I don't have a facebook profile. I don't have a "Jerx" account and I don't have a personal one. I'm not anti-social media or anti-technology. I'm not on facebook anymore because when I did have an account I found it far too easy to waste a bunch of time there, yet I was receiving no joy from it. It wasn't a type of interaction that was valuable to me. And I've tried to eliminate those types of time sinks from my life. I try to limit myself to activities that are productive or make me happy (ideally both). And facebook was neither of those things (yet it was seductive enough to occupy a not-insignificant chunk of time). So I got rid of it. Getting rid of facebook has been overwhelming positive for me, but there are a couple downsides. The first is that I'll be having a conversation with someone and they'll be like, "Did you hear Karen had her baby?" And I'll be like, "Karen was pregnant?" Facebook is an easy way to keep up-to-date on those people who are more than acquaintances, but less than close friends. And I've definitely fallen out of the loop with some people. I justify this by telling myself that if I really wanted to know everything about these people, I would have a closer relationship where we saw each other (or texted, called, or emailed) regularly. The other issue is that now a lot of magic products have facebook pages that contain further ideas, updated handlings, bonus content and stuff like that. And I've kind of cut myself off from that sort of thing. Here are a few thoughts on some of the things I saw when I infiltrated a couple of these groups. This is the page I was most excited about checking out. The Digital Force Bag is an app I gave a positive review to in the Spring X-Communication. The app is very generic (and I mean that in a good way) so there are all sorts of different types of tricks you can create with it. And I was looking forward to checking out the ideas people had. While there were a few interesting ideas, the vast majority of them were pretty underwhelming. A lot of the ideas were like, "I'm going to force something from one list, then force something from another, then force something from a third list. Then I'll show I predicted all of them." Honestly, it's fine, but it's also about the blandest use of the app you can come up with. Not only that, but the more times you use the app to have someone pick something from a list, the more your trick becomes about picking things from a list. That's not a hyper compelling premise. I'm going to give you the #1 tip I have for getting the most out of the DFB app in social magic situations. Keep your DFB list an everyday object. The strength of the DFB app is that it's something you can casually get into on your phone. Your phone is an "everyday object" which makes it good for social magic. But guess what, a list of 100 superheroes on your phone is not an everyday object. It's a prop for a magic trick. It's as "normal" as a brightly painted box with Chinese symbols on it. If you're performing as a professional, that's fine, you're expected to use props. But if you want to seamlessly weave a trick into a natural interaction, you need to keep your list an "everyday object" itself. The strongest reactions I've received with DFB happen when I use it with a list that I might conceivably have on my phone. Grocery lists, vocabulary lists, a wishlist of things I want to buy, a bucket list, places I want to visit, a list of things relating to something I'm researching, movies I watched this year (or want to watch), books I've read (or want to read), a hit-list, a to-do list, a budget, a list of my sexual conquests (don't tell me two items don't constitute a list), etc. Make the list personal and you give it a reason for existing. This takes the heat off the list and the selection process because it's not a list that was created FOR the purposes of a magic trick. And it helps with the Smear Technique, where you blur the edges of a presentation. You don't have to say, "Want to see a trick? I have a list of superheroes. I want you to name a number and we'll use that to choose a superhero." Instead it can be something considerably more casual where someone is talking about a superhero movie, or you're talking about what you've been reading, or something and you say, "Actually, my 2018 resolution was to read as many superhero origin stories as I could. I've been keeping track. [You remove your phone, turn it on and go to the notes.] I'm up to... sixty-three so far this year. It's been a fun project, but I think it may be rotting my brain, like those anti-comics people used to say in the 1930s. It's kind of all I can think about. Want to see something weird...?" Again, if you're a professional using this tablehopping, then maybe it's not a concern. But if you want to do the strongest social magic, part of that is predicated on it feeling somewhat spontaneous. And having "a list of 100 random celebrities" on your phone is the opposite of that. M.C. (I never know when to use people's full name's here or not. I'll often just use initials if I think there's a chance they'd like me to. Or if there's a chance that someone googling their name could be brought here and find something that person wouldn't want them to find.) mentioned on the Digital Force Bag group about using the app in conjunction with some specially made bills that you can get here. I haven't used the celebrity bills, but In the past, I've done some things with the custom bills they make where they put anyone's face on a real bill. I still haven't found the best use for this yet. The bill always gets a strong reaction but in a way that seems to undermine the strength of the trick itself. 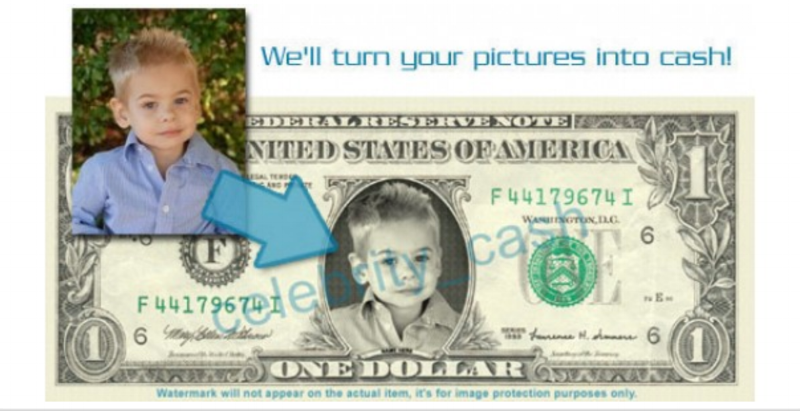 However, one thing to keep in mind is you can use this company to custom print a bill that is slightly different than a normal bill. I have a couple ideas in that regard that I may write up, but that's for another post. Just putting the idea out there for now. Of course, one thing you can always count on facebook for is super funny jokes! Do yourself a favor, get yourself a change of underwear before reading this sick and twisted slam on Ellusionist. Ah-ha-ha-ha. Time to close up shop, Ellusionist. Ya been burned. Eek-llusionist? That's some searing satire, the likes of which I haven't seen since MAD Magazine took down the Partridge Family with their piece called the Putrid Family. Funniest meme ever aside, M.H., who brought this to my attention, has a good point that something like this could make an intriguing presentational hook for a trick. Imagine you strap something like this on your spectator and ask her to cut the deck into four piles with the hand that has this gizmo on it. You turn over the top cards and there's nothing of note there. Then maybe you tighten up a screw or you apparently make some adjustment to an app on your phone. Then you have her cut the deck in four again and this time she's found the four aces. You don't show too much excitement. "Okay, okay..." you say, apparently deep in thought. "Oh, thanks for your help. This is just a prototype we're working on. Ultimately it needs to be small enough to be implanted under the skin or a casino will never let you in wearing one of these." I love Cryptext and use it a lot. If you don't know what it is, it's a way of doing a reveal in an effect where a number that has been on view is turned over and shown to be a word when upside-down, or vice versa. However, there seems to be a fundamental misunderstanding about how to use this tool by the members of the facebook group. 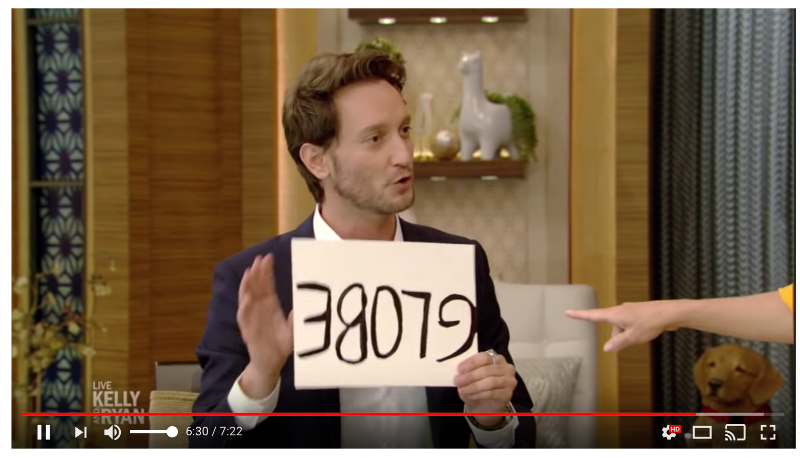 Here's Lior Suchard botching it on a recent performance for Kelly Ripa and Ryan Seacrest. You only really need to see one still image from the video to make the point. That's supposed to be Lior revealing his prediction of a number, 38079. But, of course, it doesn't look like a number. It looks like an upside-down word. And that is, in fact, what Kelly is pointing at right there. Lior has to cover up the number partially and then quickly do the final reveal because it's so obvious what is about to happen. Cryptext will always get a good reaction, because it's a fun reveal. But it's a much stronger reveal when the audience doesn't see it coming. With that in mind, you want your initial word or number to look as genuine as possible. You need to prioritize the look of the first display. Yes, you want the reveal to be as easy to "see" as possible, but not to the extent that they're ahead of you and the ending is blown. The entire Cryptext Facebook groups is filled with examples where the initial display word or number looks like no word or number a human has ever written. If you said it's the number 5010016, you're right. You're also out of your goddamn mind because it doesn't look anything like that. I sent that picture to a friend and asked him what he thought it said and his response was: "S, Six, 1, Backwards C, Six, Lambda, Six." The truth is, not every word or phrase is suitable for Cryptext. If there's no way to make the reveal somewhat legible other than making the initial word/number a bunch of jumbled gobbledygook, then you need to come up with a different reveal. I can understand why the professional magician would want to have the final reveal hit immediately (although I don't think you should sacrifice the surprise for that). And for the social magician, it's not needed at all. It's actually okay if the final reveal takes a moment to see. Your instinct is that you need to immediately hit them over the head with it, but you don't. Think of the best twists in movies. They're the sort of thing that dawns on the full audience gradually. It's not Bruce Willis coming out and saying, "Actually, I was dead the whole time." To be clear, there were ideas I liked in the groups I visited on facebook too, but I'm going to assume they want those idea kept private (since they're private facebook groups). My thoughts above on DFB and Cryptext are things of a more general nature. Will I be getting a facebook account and taking part in discussions there after my recent visit? I doubt it. If I do sign up it's so I can be a part of one particular group (and I hesitate to mention it here because it's kind of a tight-knit group of guys and I don't want membership to blow up). It's the group, WE can teach u a awesome joke and magician!!! There's some pretty powerful ideas being thrown around there. Admittedly the posting there has been a touch light since 2010, but I'm thinking it will pick up soon. I suspect Arfa is going to get us the punchline to the "vampire's favorite ice cream" joke sometime in the next few years and then things will really get moving.